I've seen this idea a million times, but never carried it out until yesterday. 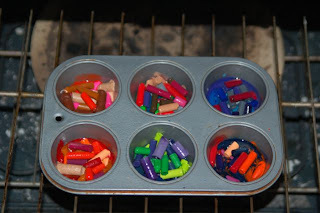 All you need are some crayons, an old muffin tin and an oven. Tear the paper off the crayons. The toughest part was getting the paper off the crayons. It seemed that it was glued on many of the crayons! 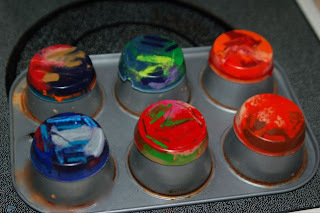 Break the crayons into 2 or 3 pieces and put the pieces into a muffin tin. 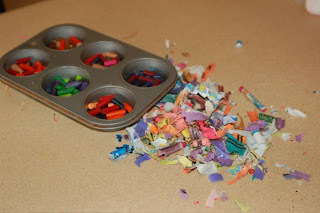 I would guess that we broke up 6-8 crayons for each muffin tin. Preheat the oven to 200 degrees. 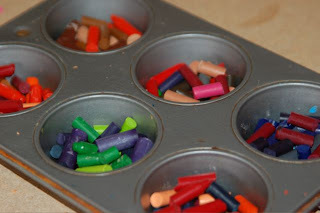 When the crayons have been sorted, pop the tin into the oven. Wait 10-20 minutes, until all the crayons are melted. We found that some of the crayons melted much slower than others -- which I'm guessing was because they were different brands. I'm not sure about the different melting temperatures of wax, but it appears there are definite differences! When the crayons were cool, I simply twisted the pan a little bit and they popped right out. The boys had fun coloring with their multi-colored disks when they were finally cool. They also found it very interesting how the different colors melded together in the oven. The crayons turned out great. I like this little blog of yours. I've been to your other one before, but it's been awhile. I'll have to check out your learning notes. Oh, by the way, thanks for responding to my question about nature journaling. Wonderful tips! That is such a cool idea! I gotta try that!